''Summer Ride'' is a bright and joyful painting. 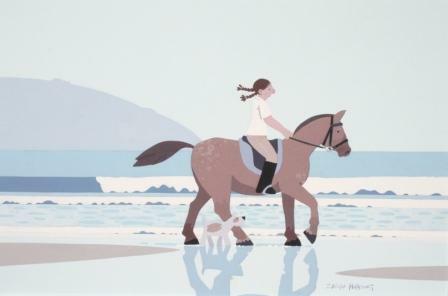 A horse, rider and dog make their way along the seashore enjoying the sea breeze, their reflections mirrored in the wet sand. Harding''s sense of humour sparkles irrepressibly through her paintings and she shows great affection for her subject. Sasha Harding uses a selective palette to reflect the gentle, natural colours of the seashore. She uses clean lines and clear images to depict her modern coastal scenes.. Although born in Bath, Sasha Harding grew up by the sea on the south coast in Dorset. Her contemporary paintings are inspired by her happy childhood spent on the coast of Dorset. She continues to live close to the coast and finds on going inspiration from the seashore and local life.